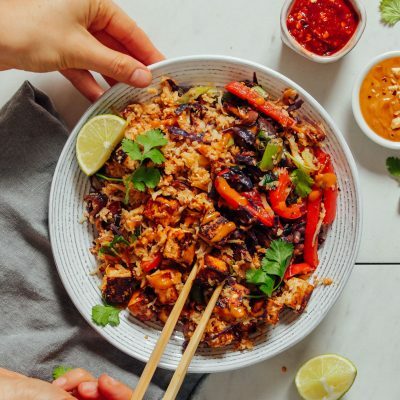 Look no further than this delicious nourishing, flavorful stir fry to help power you through your day. Plus, it’s packed with veggies, protein, and fiber and takes just 20 minutes to prepare. Let me show you how! To start, the tofu is briefly marinated to provide flavor, then cooked to perfection (option to crumble the tofu for extra speedy cooking!). Next, the veggies are sautéed until they’re tender but still have nice texture. We chose mushrooms, cabbage, and bell pepper this time, but the possibilities are endless! Then comes the cauliflower rice (well hello there, more veggies). Cauliflower rice is really the coolest. You can read our tutorial on How to Make Cauliflower Rice or, if you are looking for something even quicker, many stores now carry a grab-and-go version (check the produce and/or frozen section). Alternatively, you could also substitute some pre-cooked grains to save even more time. Lastly, add in the sauce and that’s really all it takes! Lunch or dinner on the table in about 20 minutes flat. 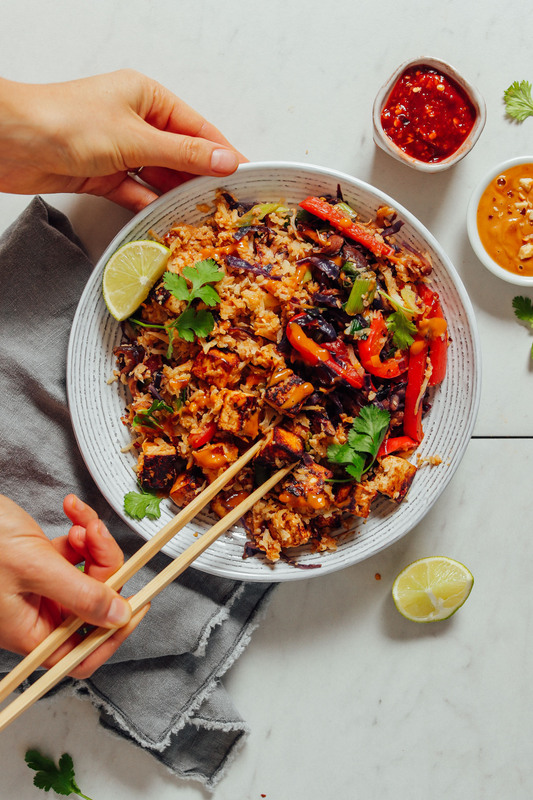 If you’re into stir fries, be sure to check out our 30-Minute Tempeh Stir-Fry, Cauliflower Rice Stir-Fry, Quinoa “Fried Rice,” Almond Butter Tofu Stir-Fry, Tofu that Tastes Good Stir-Fry, and the fan favorite General Tso’s Tofu Stir-Fry! 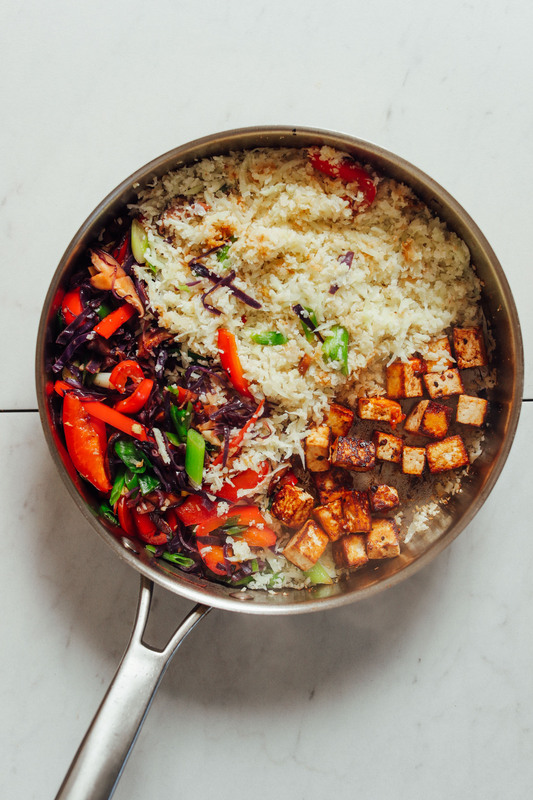 A FLAVORFUL veggie-packed Tofu Stir Fry that comes together in just 20 minutes! Gluten-free, plant-based, and perfect for weekdays. If you haven’t done so already, prepare cauliflower rice or cook grains such as white rice, brown rice, or quinoa (not included in prep/cook time as it’s ideal to use leftover grains or cauliflower rice). 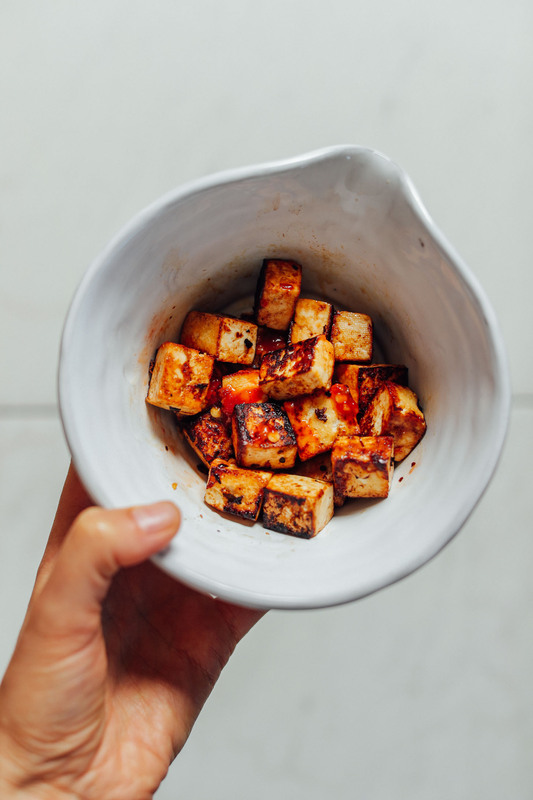 Add cubed or crumbled tofu to a plate or shallow dish along with coconut aminos and chili garlic sauce (optional) and gently toss/stir to coat. Set aside to briefly marinate. Next, prepare sauce by adding all ingredients to a mixing bowl and whisking to combine. 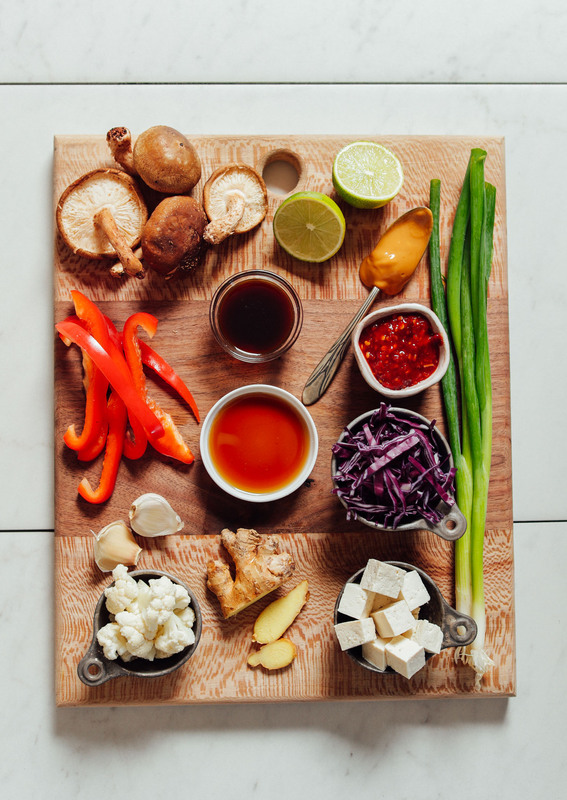 Taste and adjust flavor as needed, adding more chili garlic sauce for heat, lime juice for acidity, maple syrup for sweetness, peanut butter to thicken, or coconut aminos for saltiness and depth of flavor. Set aside. Heat a large rimmed skillet (or wok) over medium-high heat. Once hot, add sesame oil (or water) and marinated tofu (including any remaining coconut aminos) and cook until brown, gently flipping a few times to ensure even cooking. Remove from skillet and set aside. Return the same skillet to medium-high heat. 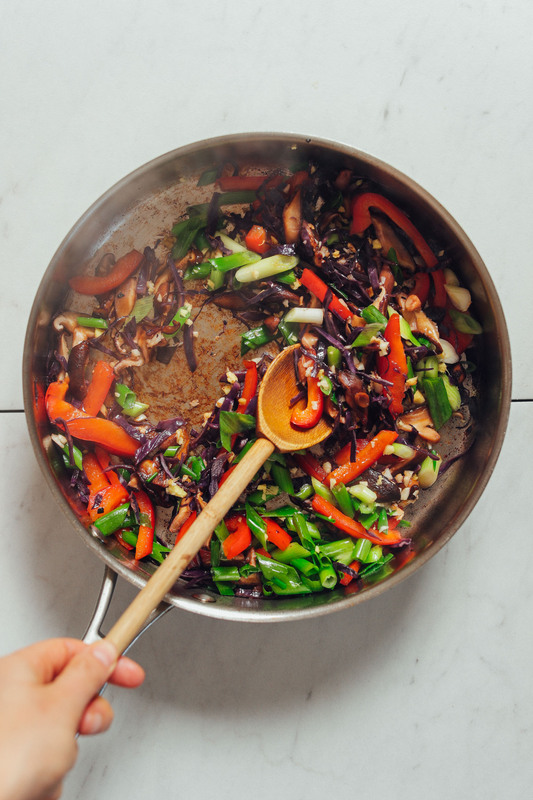 Once hot, add sesame oil, mushrooms, cabbage, and bell pepper and stir to sauté veggies. Cover and cook 2-3 minutes, stirring occasionally. Next, add garlic, green onion, and ginger. Stir, cover, and cook for another 1-2 minutes. Use a wooden spoon (or similar utensil) to move the veggies to one side of the pan. Add cauliflower rice (or cooked grains) to the other side of the pan. Cover and cook for 2 minutes or until slightly browned. Return cooked tofu to the pan, add sauce, and stir fry for a few minutes, tossing/stirring occasionally until sauce is well incorporated and all ingredients are hot. Serve as is or garnish with lime wedges, freshly chopped cilantro, additional peanut sauce, and chili garlic sauce or sriracha (all optional). Best when fresh. Leftovers keep covered in the refrigerator up to 3-4 days. Reheat on the stovetop until hot. *Crumbled tofu will cook faster than cubed. *Prep time does not include prepping cauliflower rice or cooked grains. This is meant to be a quick lunch idea that requires those things to be prepped in advance to easily throw in a pan and cook. *Our preferred method for cooking white rice is bringing 1 cup white rice and 2 cups water to a boil and then covering and simmering for ~20 minutes or until tender. *Our preferred method for cooking quinoa is adding rinsed quinoa to a large saucepan and toasting over medium heat for 2 minutes. Add water and bring to a boil. Once boiling, reduce heat to a simmer, cover, and cook for 18 minutes or until water is absorbed and the quinoa is fluffy. 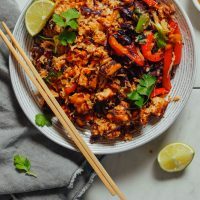 * If you want to prepare this dish partially in advance for even quicker results, you can chop veggies, press and cube tofu, make cauliflower rice (or cook grains), and/or prepare sauce up to 3 days prior. *Nutrition information is a rough estimate calculated with lesser amount of coconut aminos and chili garlic sauce and without optional serving ingredients. My friend and I just made this tonight and it was FLAMEEEE. So delicious. I’m in college and don’t have excess amount of time to make food, and this recipe came together so quickly. We used a cabbage kit from the grocery store and added radishes and sugar snap peas, plus fresh lemon squeeze, which I would highly recommend. Everything else was followed according to the recipe. This was filling, easy to put together, but still a variety of fresh ingredients to equate a nice substantial dinner. No question will make again. I made this and it came out great! Doubled the recipe and made it for the wife and mine’s Sunday meal prep. Only thing I changed was instead of riced cauliflower, we used soba noodles. Wow this was delicious! Have a block of tofu sitting in the fridge that I intend to sacrifice to the same cause later this week. I didn’t have tofu when making this, so I did pretty much the same thing with Tempeh except I marinated the tempeh in coconut aminos, sesame oil, white rice vinegar, salt, some ginger, and garlic. Still came out super delicious! Thank you so much for this recipe! Made this for dinner on a weeknight. It was easy, quick and fantastic tasting. One thing I love is that this would be easy to “personalize” using varying vegetable combinations, dependent on what you had available at the time. I also love how easily the sauce is adjusted to the flavor you want to be more noticeable- sweet, salty, etc. Will absolutely make this again! Just made this and it was AMAZING! I didn’t put any red cabbage but it still came out delicios, but I’m definitely going to include it next time so it adds a little crunch and balances out the spicy flavors. The “20 minute stir-fry” is lying a bit because it took 2 hours to prep and cook for me, even then, cooking it took around 30-40 min for me. But it doesnt even matter because it came out really good! Also, if you’re trying to feed a family on this recipe, or even a hungry couple, I would go ahead and double it. I made it for my gf and I, but I barely left any for her because I ate so much of it, so I hope she doesn’t kill me when she comes home lol wish me luck guys! I’ve tried countless stir fry recipes and have always been disappointed. I finally found one that both my husband and I love. It’s got all the right flavors. So so yummy! I doubled the recipe and it took me more like an hour start to finish, but I will make this again and again. This will now be one of my staple meals! I love these kind of recipes, they’re quick, simple, and easy to modify in order to use what’s on hand… and delish! I decided to try and crumbled the tofu method – awesome! Mine was also served on a bed of baby spinach. I used diced portobello mushrooms, broccolini (brocolette? ), red capsicum (red pepper) and tri-colured quinoa. On typing this up I realised I forgot to add the ginger, but didn’t notice (next time I’ll add it though). I also opted for the aminos over tamari, and only a drop of the sesame oil in the pan before cooking everything up. This was amazing. I loved the flavor. I doubled the recipe so that I could have it as my lunch or dinner for the rest of the week. If I made it again, I would probably add one more veggie in there to bulk up the dish. This recipe could also be good cold and tossed with greens for a salad. I think I will try that this week! Loved the concept of this, and was really excited to try it after reading the reviews. BUT I will need to make a few tweaks for next time. I made a 4 serving portion, but it was totally dominated by the fresh ginger and the chili garlic sauce. I couldn’t taste the lime (which I doubled), the almond butter, the garlic, nor the sesame oil. Note: the 4 serving size portion calls for 2 tsp of chili garlic sauce and I had only used ONE tsp. I used “Yai’s Thai Chili Garlic Hot Sauce”. I don’t know if this one is hotter than other brands? Next time I make this I will use less ginger and even less chili garlic sauce. I have a pretty high spice tolerance and so does my boyfriend, and we both had the same opinion. Thanks for sharing, Carolina! I haven’t tried that brand of chili garlic sauce, but Huy Fong Foods is our go-to and definitely not overwhelmingly hot. Hopefully next time scaling that and the ginger back will help! This ended up taking me 1 hour and 15 minutes from start to finish, sooooo very off from the title! End result was a little watery (perhaps from all the covering from cooking? ), and needed more salt. Sorry to hear that, Anna! We find that recipes tend to take longer the first time someone makes them, but after that, it becomes faster! To make it less watery, we would recommend cooking a little longer in step 8 to evaporate more of the moisture. Hope that helps! I think I’m going to make this for dinner tonight. This will be my first time trying tofu. This may seem like a silly question, but are there any certain tips I need to know when prepping the tofu? Hi Ashley, the only thing to note would be to make sure to press the tofu (we use this press, but a heavy object and kitchen towel can work also!) to remove some of the liquid. It helps it crisp up. Hope that helps! Happy cooking! Just made this for dinner with basmati rice and my husband and I loved it! Not a veggie combination I’d normally think to use, it was fantastic! So glad to hear it! Thanks for sharing, Lauren! It definitely took me more than 20 minutes, but it was worth it! It was so delicious. I doubled the recipe so we would have leftovers, and I was glad I did! Yummy! I cooked the tofu on the stove, not the oven (can’t manage balance needed for the oven), and used brown rice, not cauliflower rice. Good as leftovers, too, though there’s not much left. OMG! I absolutely **LOVE** this. This is a great way to use leftover rice/quinoa as well as when you have random vegetables and you need inspiration. I have already found your other stir fry recipes and going to try them all. Yay! Thanks for sharing, Sunny! This looks delicious, but 20 minutes?! Does that include chopping everything? There’s no way I could put the whole thing together in 20 minutes. Not to say that others can’t, but I was disappointed after reading through and seeing all that’s involved for something labeled 20 minutes. You chop the veggies and make the sauce while the tofu is marinating! I’d say the 20 minutes is aspirational, but the dish was delicious. I plan to make it a lot to get it down to 20 minutes. Also, this was the first time I’d made cauliflower rice. So easy and delicious. So thank you for that. Any suggestions for a substitute for nut butter? Can you eat almond butter? Or sunbutter (from sunflower seeds)? I used almond butter and it was delicious. Perhaps sunflower butter if you can have that? Hope that helps! This was outstanding! I add broccoli, sugar snap peas and zucchini because I needed to use them before they got nasty! Hubby doesn’t like tofu so I left that out. Delicious. This looks so good. I make your fried rice a lot, and bake the tofu first so it gets crispy and delicious. This would be a faster and easier way to perpare the tofu, I’ll have to try it! I could eat stir fry every day. Agreed! Such a quick meal. I can’t wait to try this! Quick question – do you have any issues with frying the tofu and it falling apart? I typically fry tofu per your General Tso’s method, with a coating of cornstarch. Should I just go for it straight from the marinade? My concern is that it may fall apart in the pan, or not have the crunchy type texture. 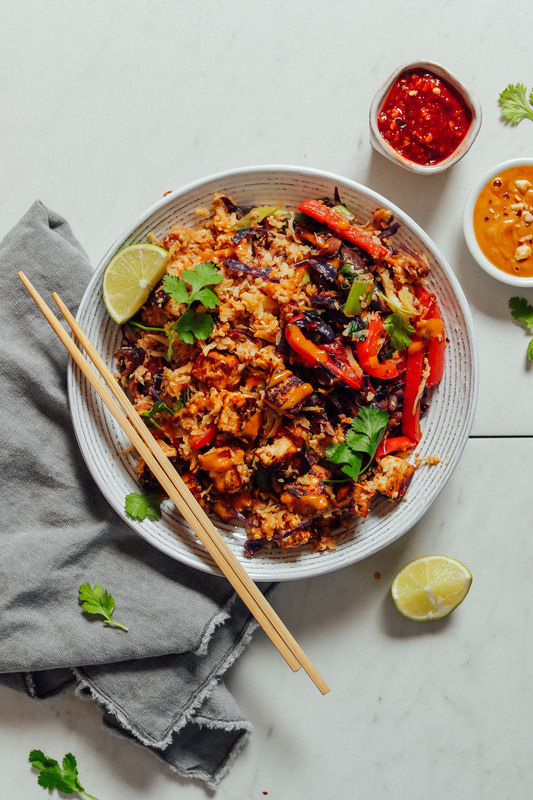 I’ve never tried riced cauliflower, but what a great idea for a stir fry! My husband was just saying he wants to cut out most of the grains and starches we eat, so this would be a good replacement. This is not going to be the crispiest texture, but it is very flavorful. If you really like the General Tso’s method, you could skip the tofu method in this recipe, use the General Tso’s version and throw that in instead. Hope that helps! Looks Great. How long will this keep for? 3-4 days! For future reference, you can find how long it keeps and whether it is freezer friendly right above the ingredients header. Hope that helps! Is there anything that we can use instead of the chili garlic sauce in your recipes? Our family loves foods like this, but we are serving picky kiddos who don’t like anything “spicy”. Thanks for all the amazing recipes! I would totally eat this “as-is” in any other scenario. It sounds delicious! Feel free to omit! Should still be plenty flavorful and tasty. Hope that helps!